Can tiny houses be an answer for students without a home? Laney College students, who were homeless, have moved into a Pocket House—a type of tiny house—that could serve as part of a solution to the housing crisis in Oakland. A fire tore through The Village on Friday, destroying tents belonging to 15 people and causing further concerns about the safety of homeless encampments. 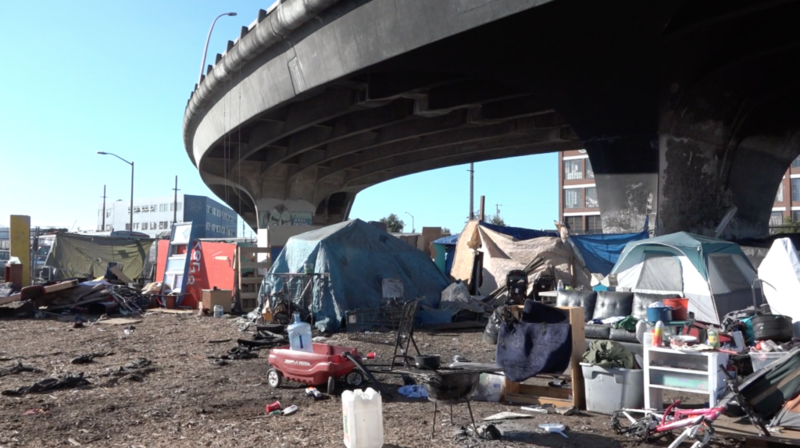 Residents living under the 12th Street bridge stave off an encampment clearing while residents at another homeless encampment, “The Village,” prepare to relocate. Over a year after Oakland declared a state of emergency on homelessness, during a sparsely-attended city council meeting on Tuesday night, councilmembers passed two resolutions intended to help those living on the streets. Life is hard enough as it is for Oakland’s homeless encampment residents. Adding to the long list of adversities, however, is petty theft and other low-level crime. And that’s just the beginning of it. Watch how residents of The Village, a homeless encampment in East Oakland, are recovering after a fire displaced 37 people. And see how a fire is the least of residents’ worries in the coming months. As the city and local volunteers rush to assist those displaced by an early morning fire at the East Oakland homeless encampment, questions and concerns about safe living spaces still remain. The City of Oakland approved a new experimental short-term housing solution, called The Village. After a year of negotiations, they’ve been granted land by the city, and are building houses for the homeless. Community members and city officials struggle to confront the the epidemic of hundreds of Oakland residents–most of them black, many of them elders–sleeping on the streets due to to skyrocketing rents and a lack of affordable housing. Volunteers from Oakland-based organizations are distributing respiratory masks to homeless people in Oakland to stave off poor air quality caused by historic wildfires in California’s Wine Country.